Well, it’s going to be interesting again over the next couple weeks trying to figure out which day our humungous backyard maple tree will decide to let its leaves turn from green to yellow and then drop them all at once like a clumsy waiter. It happens just that quickly as if our maple is showing off to the hundreds of other maples in the neighborhood that it can hold on to its leaves longer and shed them faster than all the rest. Seeing those leaves stack up each autumn always takes me back to the home town of my youth when leaf disposal was a whole lot different..and memorable. There was no having to cram them into expensive paper bags and pay admission to a leaf drop-off site. You simply put a match to the pile and torched ‘em. Soon, bright orange flames would appear and the air would be filled with blue smoke rising to the sky and a wonderfully sweet aroma like no other that makes this nostalgic old sap’s knees go weak just thinking about it. Everyone in Volga during the fifties burned their leaves with the exception of a few who had figured out the value of them as mulch for their spring gardens. My mother gardened too but she wasn’t a mulcher. I remember her referring to those stacks of decaying leaves and other waste, which some people had in their back yards, as rodent apartments. My mom wasn’t afraid of much but she had a passionate dislike for mice. The job of getting the leaves picked up fell to my big brother and me. We did not volunteer nor did we accept the assignment without considerable whining. I was particularly reluctant because we had two rakes at home; one of those springy fan-shaped jobs and the other a heavy iron garden rake and there was no doubt as to who would be stuck with it. That thing may have been fine for moving black dirt around…but was worthless for leaves. Every few swipes would require stopping to remove clogs of leaves that had become impaled on the tines. Eventually, though, they all ended up in a huge stack on the gravel street at the end of our front walk. Exhausted, my brother and I would both let ourselves fall backwards onto the soft yet crunchy pile and just lie there for a few minutes wishing, perhaps, that we could be so lucky as our two big elm trees and just shed all burdens till spring. But there wasn’t time for day dreaming. Before long, dad would be turning the corner in his old panel truck coming home to supper only to find a huge brown heap where his parking spot is supposed to be. Later, we’d all gather around that pile as the old man struck a match and ignited our very own bonfire. Then, mom would emerge from the house with a bag of marshmallows which we stuck on sticks and poked over the flames until the puffy white confection either came up golden brown or a black gob of char. Either way, they were sticky, oozy, delicious and a memory forever etched in my brain. I recall looking up the street and seeing the orange glow of many other fires with neighborhood families enjoying the same autumn ritual. No worries about destroying the ozone or inhaling cancer causing carcinogens or people complaining they couldn’t breathe from the smoke or setting the town ablaze. We were too dumb to know back then, I guess. But I do feel sorry for my grandkids who’ve never gotten a whiff of the ambrosia that burning leaves provide. I have a Weber grill on the back patio, maybe I’ll take the grate out and stuff the thing with leaves then invite the young ones over for a lighting ceremony and a bit of aroma therapy. I wonder if Linda has any marshmallows in the cupboard. Great story Doug. Your such a great writer. I remember that wonderful smell of burning leaves also. Too bad that GLADE doesn’t come in the “burning leaves” aroma! It would be a big seller among our age group! The asphalt paving of our Madison, SD city streets in the late 1950’s pretty well took care of the burning leaves festival. Being young teens, we brilliantly decided do try the paved street burn once…. and earned the opportunity to “chat” with our local police officers while we followed their “suggestion” that we douse the fire and clean the street to their satisfaction while they watched…,.and enjoyed..our labors! This brings back such great memories of playing in the leaf piles. I loved when mom and dad burned the pile of leaves. I can almost smell that wonderful aroma of fall after reading your story. Thank you for sharing your memories. 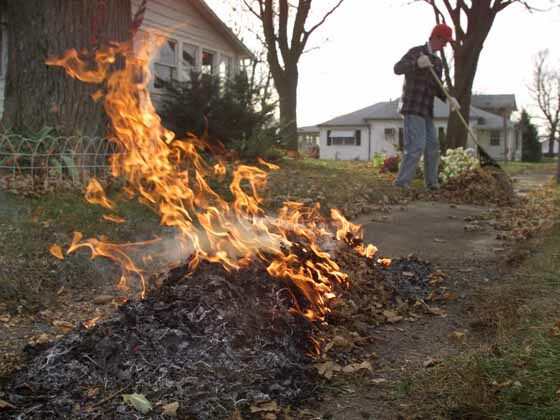 I love the smell of a burning leaf pile. The best part of fall. © 1998-2017 KELOLAND.com | Nexstar Broadcasting, Inc. | All rights reserved.